Skybird HD includes a simple but powerful Race Analyser. 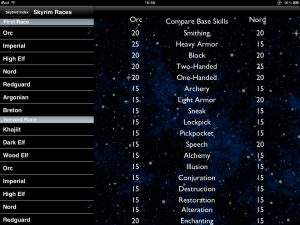 At the start of each game, you have the choice of what race to select, and each race comes with a set of base skills which are more or less powerful in certain base skills than other races. 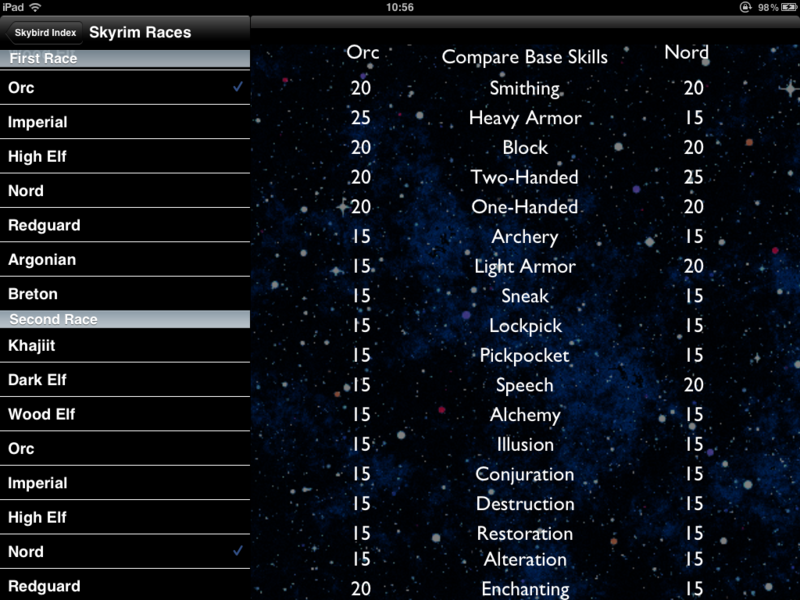 Using the Race Analyser, you select two different races using the sectioned table (a checkmark shows which two races you are comparing – click again to deselect) and the table in the detail pane shows the base skills for each of the Skill Perks used in Skyrim. By using this analyser, you can immediately see which race is better for the play style you want to aim for – no more guessing. Also, because this is available in App form, you don’t have to exit your game to look up the choice, and you won’t regret your choice after dozens of hours because you can choose wisely right at the start. Very easy to use, but essential for getting a great start.